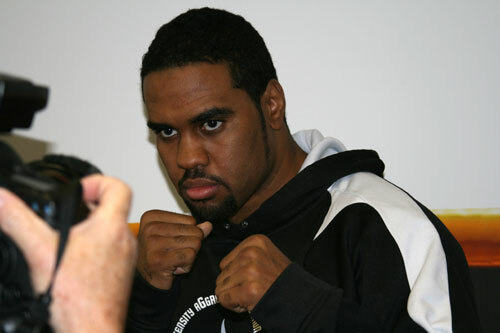 Pittsburgh native and Philly boxing product "Fast" Eddie Chambers flies to Dusseldorf Germany on Saturday (3/13/10) for his highly anticipated fight against Wladimir Klitschko for the heavyweight championship of the world. The bout is scheduled for March 20th. If all goes well for Chambers, his life will change dramatically about one week from now. As Chambers prepares to depart for the most important trip of his life, it is important to take in this moment and realize just how special this occasion is. If you made a list of all the fighters who have received a crack at the heavyweight championship - especially in these days of multiple belt holders - you'd windup with an extremely long roll call. However, if you then compare that list to all the professional fighters who fought with the dream of one day challenging for the biggest crown in boxing, that original list would look puny. Filter that list for Philadelphians and you've got almost nothing. It is clear that Chambers' quest next week is truly special indeed. Philly fans are lucky. We've seen Joe Frazier, Tim Witherspoon and a Philly-based Sonny Liston win the title. A handful of others have given it a try. Starting in the 1930s, I believe the full list is as follows: Tommy Loughran (vs. Primo Carnera, 1934), Gus Dorazio (vs. Joe Louis, 1941), Jimmy Young (vs. Muhammad Ali, 1976), Tex Cobb, Marvis Frazier, David Bey (all vs. Larry Holmes, in 1982, 1983, 1985), Bert Cooper (vs. Evander Holyfield, 1991), and Jesse Ferguson (vs. Riddick Bowe, 1993). So Eddie becomes the first Philly fighter in seventeen years to fight for the title. If he wins, he'll be our first heavyweight champ since Tim Witherspoon's second stint in the job twenty-four years ago. Chambers will have to upset the odds to do it. Currently Las Vegas is listing him as an 8-1 underdog. Much has been written about Eddie's lack of size compared to the Ukrainian champ. Chambers will spot him five and one half inches and about thirty pounds. Nothing to sneeze at. But Chambers will look to use his speed and smarts to out-maneuver the bigger man. Will he do it? Some say yes, more disagree. Clearly it is a fight Chambers can win if he keeps to his plan and has the fight of his life. Whether he can leave with a decision over Klitschko in Germany, is another question all together. But this is Eddie Chambers' moment. He and his team, most notably trainer/manager Rob Murray, Sr., have done a great job. They have worked hard and have provided us with one of the most exciting stories in recent years - "Eddie Chambers fights for the world heavyweight championship". Team Chambers deserves a big thank you. 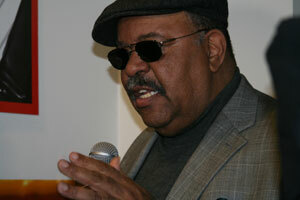 Yes, this is Eddie Chambers' moment. A win on March 20th, puts him in extremely rarified air and makes this the Eddie Chambers era. Very exciting. He is to be congratulated for coming this far. But Eddie needs to WIN this fight. The TV networks have rejected the bout (we can only watch it on klitschko.com). Philly will love Chambers win or lose, but the rest of the world - HBO, Showtime, and boxing fans outside of Philly - require a victory. It's not that he couldn't eventually get another shot, but you have to take these opportunities when they come. Ask anyone who's placed second on American Idol. Eddie can win this fight. Excuse us while we pile on the pressure. Imagine Philly once again being the home of the heavyweight champ. When Chambers boards that plane for Germany, all of us in Philadelphia will be taking the trip with him. And we will be hoping that he wins the fight. 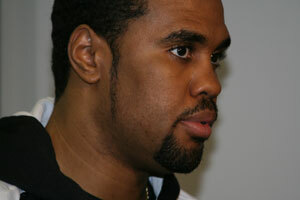 Eddie Chambers - world heavyweight champion. We hope he wins it for himself, his family, the Shuler Gym, Rob Murray, the USA, Philadelphia, and all of us under six foot-six. Good Luck Eddie! 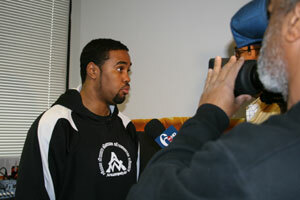 On March 10th, a large group of media, friends and well-wishers assembled for "Eddie Chambers Media Day" at the WURD AM radio station offices on Delaware Avenue in Philadelphia.